It all started with Scooby Doo, The Princess asked me explain Faberge eggs. She had been watching Scooby Doo Cyber Chase and there was a joke in the story about Daphne’s mom trying to boil Faberge eggs. And they say TV makes you stupid! 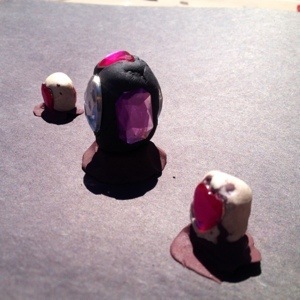 After explaining my limited knowledge of Faberge eggs (essentially that they were made in Russia for the Zcar and they very fancy and covered in jewels), we decided to make our own eggs. We came up with two versions. One is made of tin foil with jewels glued on it. Super easy! The second involved the kids taking clay and sticking the jewels straight into the clay. 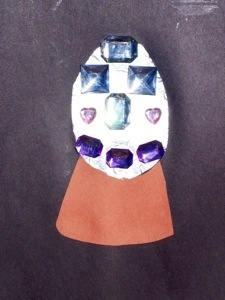 This was developed by The Princess, after all she is only five and anything with jewels qualifies as fancy right? 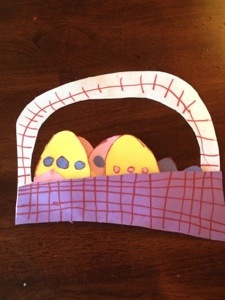 We also added construction paper eggs and a basket. This was way less work than actually dyeing eggs. No one ever eats the boiled eggs so they got to waste. Plus I end up getting dye everywhere and the eggs end up the color vomit! So this was a happy solution. The King’s Grave: Reviewed by Booky MoM! England’s cruelest king? Just about everyone has heard of the “two princes in the tower”. And, most people know it was evil uncle Richard who sent them there. And, to be honest that’s about all knew either — until now. The book mixes the discover of Richard’s bones with a look at the history of and surrounding the king. It’s a quick and interesting read. And, we get an accessible look at excavating and archeology. As an American interested in the topic, it never ceases to amaze me what is hiding just under our feet-particularly in Europe. Of course we have digs of native Americans in the US. But finding a king in a car park is just wild! Readers are treated to the role science plays in teasing out history. And, we are treated to an understanding of the physical challenges facing Richard. As for resurrecting Richard’s reputation, I am not sure the book fits the bill. The author is clearly pro-Richard, but she does a nice job of still presenting the facts. I did find a few parts about the project to be filler and or an ego trip. So I simply skimmed them. All in all, a fun read.